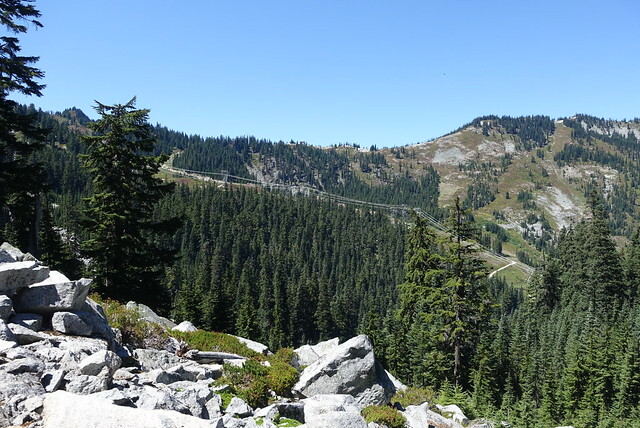 .A hot hiking day into Stevens Pass. There actually isn't much to report today. I got up early, and was on the trail at 6:50am. It's a town day, yay, and I wanted to make quick work down the trail before it got too hot. 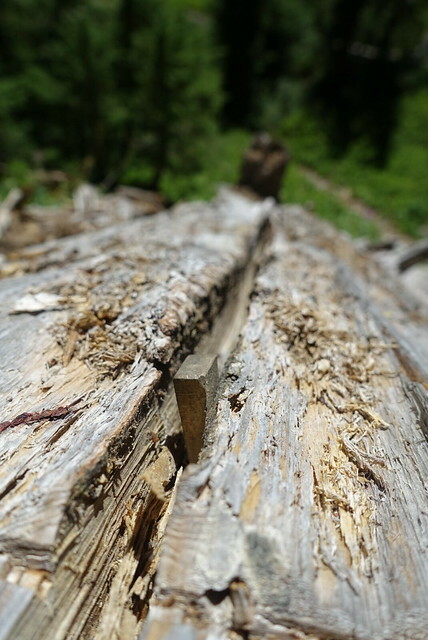 The trail today was kind of a roller coaster: lots of very steep mile-long sections, going up and then down, then level, then up and then down. 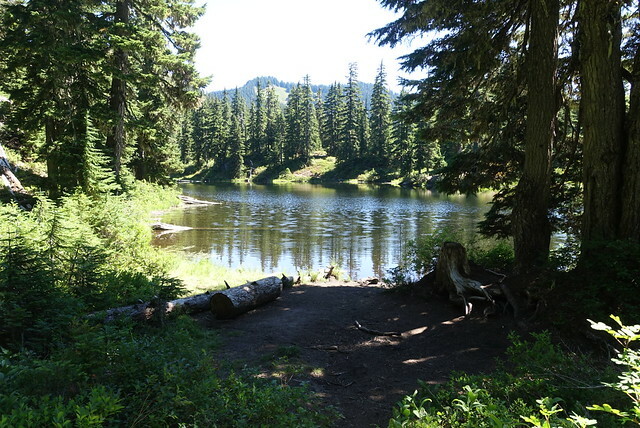 Plenty of scenic views, and as I got within ten miles of Stevens Pass trailhead, there were plenty of hikers getting a jump on their weekend as well. 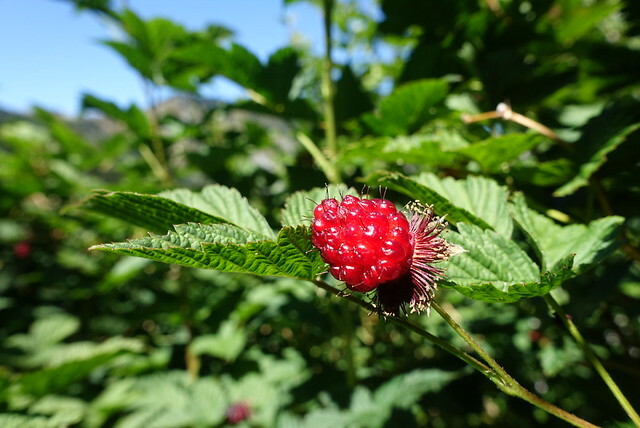 For some reason there were lots of salmonberry bushes along the trail, I once again learned that they look tempting but aren't really that tasty. I did bump into Bipolar on the trail as he was resting, greeting him with "Paul!!" and chatted for a bit. 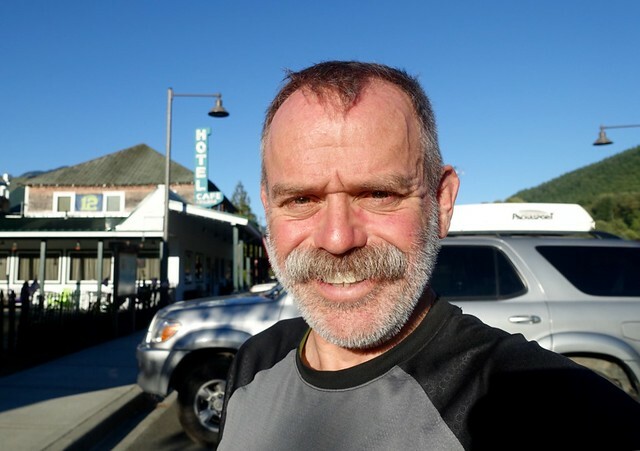 He was hiking with a buddy named Lyle, and heading into Skykomish as well. I kinda expected to see him in the evening, but didn't see him, ah well. 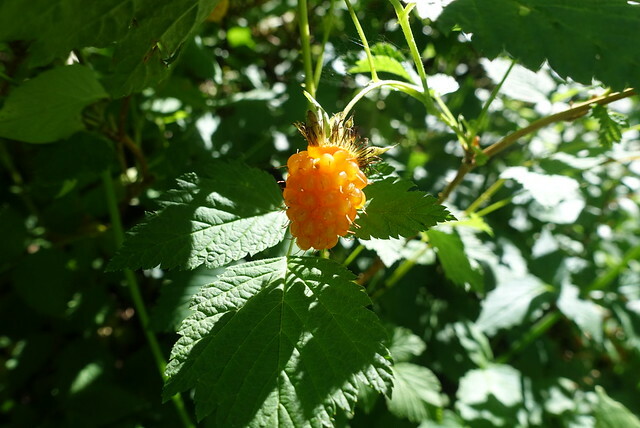 Red salmonberry. Still not tasty. I followed the trail down to the parking lot, past the Stevens Pass Resort, then said "Hey, I deserve a beer on this hot day", and treated myself to a beer. There were lots of mountain bikers around, I got to chatting with one of them about everything. It was a pleasant afternoon of not doing much; I might just hit the place for lunch before heading out tomorrow. Around 5 I wandered down the steps to the parking lot and asking folks for a ride and got one quickly: the simple "Hi, I'm looking for a ride down to , can you help?" works well, and the second guy I asked said "Absolutely!" His passenger side floor had a few REI receipts on it; his name is Chuck and he works at the REI flagship store in Seattle in the bike department. Thanks Chuck, for the ride to Skykomish. Hello Skykomish and the Cascadia Inn! 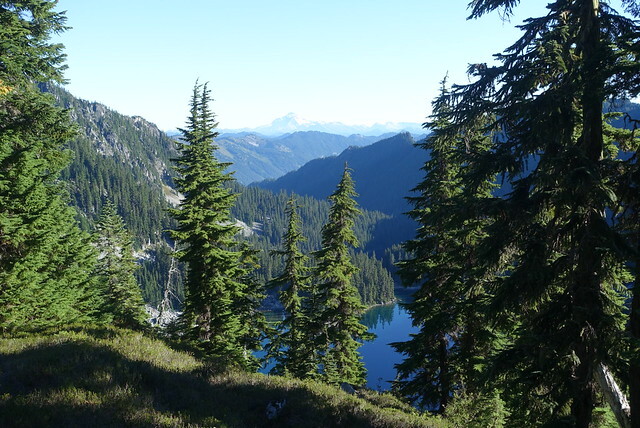 I remember visiting Skykomish a couple of decades ago, and it's still very small. 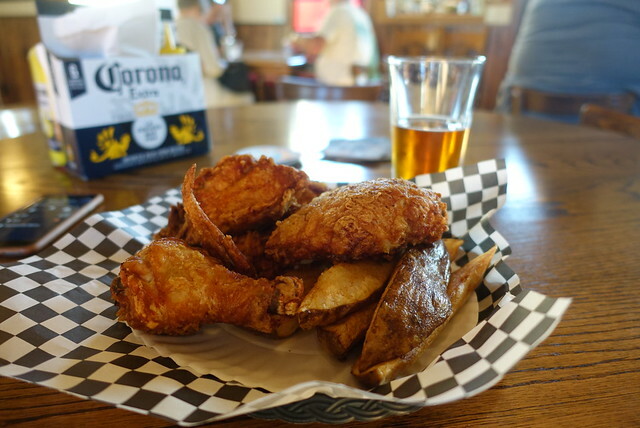 My little stop for the night, the Cascadia Inn, was comfy, and I considered eating dinner in the restaurant (pan fried salmon) but the Whistle Stop next door got raves for its pressure cooked fried chicken, so that was a must. Damn was it tasty, a winner. Not much else after that--packed up my pack, surveyed my food, uploaded pictures to Flickr, checked the weather (cooling, maybe even cloudy, maybe even showers in five days) I looked at more details about the fire closure just before Stehekin, about six days walk away, and decided it would either be over or not. I pretty much fell asleep with the lights on at 11. Still have to order new trekking poles and get a Greyhound ticket from Manning Park to Vancouver. The end is near!